It’s stories like this that make history and roaming graveyards so interesting to me. 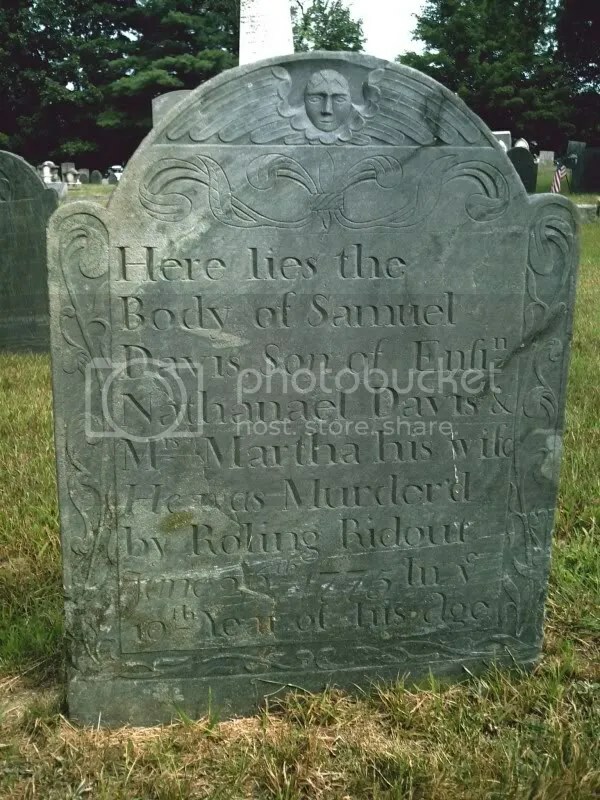 THE FIRST MURDER COMMITTED IN THIS TOWN, SO FAR AS IS NOW KNOWN OCCURRED JUNE 26, 1775 WHEN SAMUEL DAVIS SON OF ENSIGN NATHANIEL DAVIS WAS SLAIN WITH AN AX IN THE HANDS OF ROLAND RIDEOUT, AN INSANE PERSON. DAVIS WAS ENGAGED IN CONSTRUCTING A WATER HEDGE AT THE SHORE OF THE MERRIMACK RIVER, ON THE LINE BETWEEN HIS FATHERS LAND AND THE CUMMINGS FARM, ABOUT SIXTY RODS NORTH OF TAYLORS FALLS BRIDGE. HE WAS BORN IN THIS TOWN DECEMBER 21, 1757. PROBABLY RIDEOUT WAS ASSISTING IN THE WORK, AS ON MARCH 6, 1775 THE TOWN VOTED TO GIVE NATHANIEL DAVIS FOUR SHILLINGS PER WEEK, LAWFUL MONEY, FOR KEEPING ROLAND RIDEOUT. RIDEOUT CONTINUED TO CAUSE THE TOWN MUCH TROUBLE AND EXPENSE, UNTIL 1779, WHEN HE WAS REMOVED TO WILTON AT THE EXPENSE TO THE TOWN 30p-5s-0d LAWFUL MONEY. DAVIS, Samuel, yeoman, of Nottingham-West, vs RIDEOUT, Rowland, yeoman, of Nottingham-West, rec date 1776, recognizance, murder, file #2251. Rowland pleaded not guilty however from the evidence presented it was obvious that Rowland hit Samuel Davis in the back of the head with an ax. Rowland was committed to confinement for an unspecified period where he died in 1779. Nice job, I know what it is like to do all that research and it seems like nobody notices. Wonderful documentation on this!The headstone is a history lesson in itself!Thank you for sharing this! Great story! I love all the primary source documents. Thank you for posting this story.